Note: Sorry this photo isn't that great. I tried several times and I just can't get a good shot of the bow. Hi all! Happy Friday! 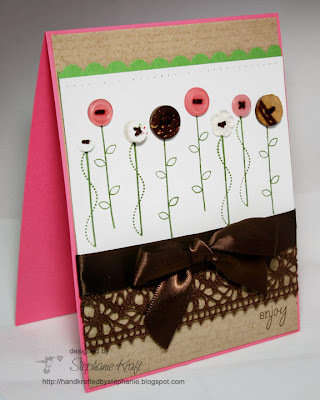 I've been inspired by Nichole's latest cards and am patiently waiting to be able to play with one of her new Papertrey sets, Everyday Button Bits, which she introduced here. I ordered this set last week and it is probably waiting for me at home now. It's such a clever set, designed around the use of buttons as part of the main image. While I'm waiting for it, I decided to pull out one of my neglected CTMH sets and stamped the line of flower stems. Next I added some fun buttons as each "flower". Finally, I stitched each button hole with embroidery floss. My background Kraft cardstock is lightly stamped with Background Basics: Text Style. The crocheted trim is something I just got from Jody -- she has it in some great colors along with some other fun ribbon here! My bow was tied with the Bow Easy, which I got from Sharon. I've had it for a few weeks now and this was my first attempt at making the bow. I struggled a bit at first, but Sharon has a great photo tutorial on her blog and Jerri Kay has a great video tutorial as well. Accessories: Scalloped Scallop border punch (EK Success), Buttons (Papertrey Ink), Embroidery Floss (DMC), Crocheted Trim (confessionsofaribbonaddict.blogspot.com), Satin Ribbon. What a darling card! I love the buttons!